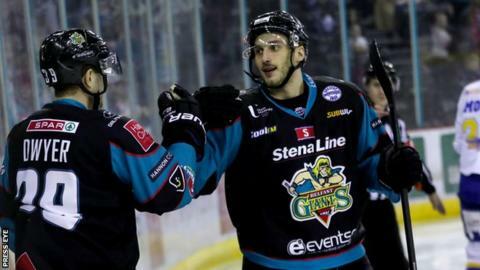 A storming start helped the Belfast Giants return to the Elite League summit with a 7-0 win over Fife Flyers. Kyle Baun's hat-trick, including the opener on 43 seconds, moved the Giants above title rivals Cardiff with a better regulation-time wins record. Cardiff have two games left and can regain the lead with a win over MK Lightning on Saturday before they face Coventry Blaze on Sunday. Belfast host Dundee on Saturday as title race goes to the final round. Kevin Raine, Lewis Hook, Patrick Dwyer and Darcy Murphy also scored for the Giants as Adam Keefe's side scored five times in a rampant final-period display that sets up a thrilling finish to the season. The home side enjoyed a perfect start at the SSE Arena when Dwyer's effort rebounded into the path of Baun, who fired past Flyer's netminder Shane Owen for the opening goal. The impressive Owen was kept busy for much of the opening period as he pulled off a further nineteen saves to ensure the visitors only trailed by one at the first interval. The Giants, who also scored seven against Coventry on Wednesday, doubled their lead less than two minutes after the break as Colin Shields and Chris Higgins combined to open up a path on goal for defenceman Raine to give his side a 2-0 lead after forty minutes. Belfast took advantage of a power play in the fourth minute of the final period as Ricards Berzins sat for a cross-checking penalty and Jordan Smotherman's shot was deflected to the far post where Baun controlled the puck and then swept home for a 3-0 advantage. The Flyers switched netminders at that point with Andrew Little coming in for Owen but the unfortunate replacement conceded the very first shot on his goal - Hook finishing an odd-man rush. Dwyer made it 5-0 with eight minutes to go, sweeping home from close range at the back post after some good work by Murphy to draw the Flyers' defence. Fife's Evan Bloodoff was sent to the bin just minutes later and the Giants again exploited the extra man as Murphy fired between the keeper's pads with a little over four minutes remaining. Baun rounded off the scoring on 56:39 with a rasper of a one-timer past the hapless Little that completed a deserved hat-trick.